Rent Tupper Manor | Corporate Events | Wedding Locations, Event Spaces and Party Venues. Tupper Manor at the Wylie Inn and Conference Center is a premier waterfront property, located 20 miles north of Boston on the historic North Shore. 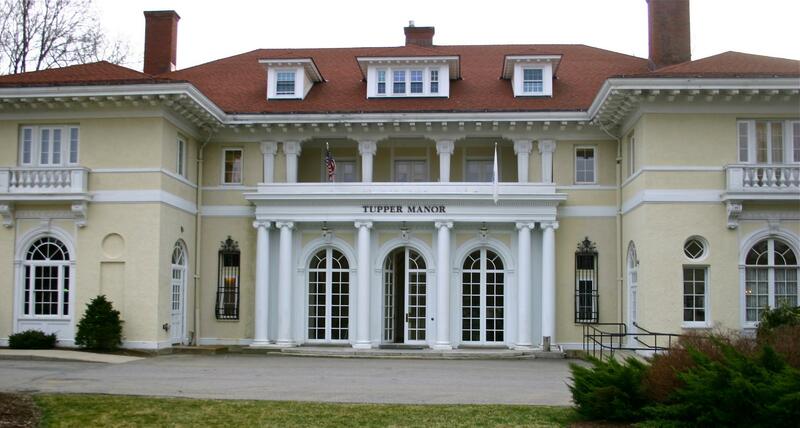 Tupper Manor offers an incomparable setting on the lovely coast of Beverly. Guests are consistently impressed by the relaxed elegance of the mansion. Weddings at Tupper Manor are magnificent. The gorgeous fountain welcomes you to the property and once you enter you’ll be impressed with the Manor’s historic architecture and beautiful interior. The marble foyer is surrounded by stunning floor to ceiling mirrors and a striking curved staircase. As you leave the foyer, tall French doors will lead you to a glass-enclosed conservatory. On the first floor you will also find a library and billiards room. In addition to the beauty on the inside, Tupper Manor is also surrounded by spectacular ocean views that provide the ideal backdrop for your wedding. We have talented wedding specialists on-site that will assist you in planning the perfect day. When hosting a dinner, celebration or other events, you will have access to the wonderful Wylie Inn and Conference Center. Offering group rates to you and your guests, our 10 acre Inn at Endicott College sits on a gorgeous stretch of the Atlantic Coast on Boston’s North Shore. We offer well appointed, comfortable accommodations with an on-site café restaurant and bar; state of the art IACC certified conference center and are located just 20 miles north of Boston. We are close by to historic downtown Salem, scenic Cape Ann, shopping, restaurants, museums, and more. With expert event planning, friendly service staff and gourmet cuisine, Tupper Manor will help turn your event into a first class event. Tupper Manor at the Wylie Inn and Conference Center is a wonderful Massachusetts event venue with the perfect setting to host your next celebration. Whether it’s a bridal shower, anniversary dinner, engagement party, rehearsal dinner, Quinceañeras, Sweet 16, Bar/Mat Mitzvah or any special occasion, we offer a lovely and sophisticated venue that includes an outstanding waterfront setting for your party with wonderful guest accommodations and convenient access to the greater Boston area.